Washington Post: "A fascinating and complex picture of the interplay between politics and media in the Cold War era." Hailed by The New York Times Book Review, Alan Furst, Bill Moyers, Alex Kershaw, Kai Bird, and more. In the summer of 1962, one year after East German Communists built the Berlin Wall, a group of daring young West Germans came up with a plan. 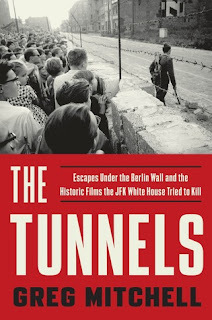 They would risk prison, Stasi torture, even death to liberate friends, lovers, and strangers in East Berlin by digging tunnels under the Wall. Among the tunnelers and escape helpers were a legendary cyclist, an American student from Stanford, and an engineer who would later help build the tunnel under the English Channel. Then two U.S. television networks, NBC and CBS, heard about the secret projects, and raced to be first to air a spectacular "inside tunnel" special on the human will for freedom. The networks funded two separate tunnels in return for exclusive rights to film the escapes. In response, President John F. Kennedy and Secretary of State Dean Rusk, wary of anything that might raise tensions and force a military confrontation with the Soviets, maneuvered to quash both documentaries. Every so often I feel the need to dip my toes into the nonfiction world and that's how I ended up with this book. I'm glad that I did. It took me a while to get through this book because the subject matter could be heart wrenching at times and I just had to sit it down and walk away. That being said, some books on history are so dry that you need a glass of something to get through them. This isn't that book. It reads more like a novel than a dry history book. If you're interested in Berlin, the Cold War, or anything of that nature, I highly recommend that you pick up this book.